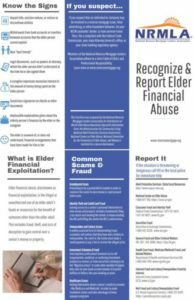 A new consumer brochure from the National Reverse Mortgage Lenders Association helps seniors and their loved ones recognize common scams and signs of financial exploitation. The free resource also includes contact information for government authorities and victim support organizations. 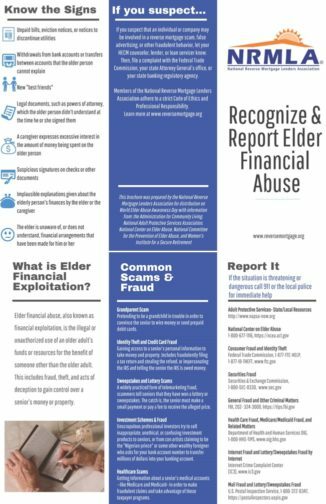 Elder financial abuse, also known as financial exploitation, is the illegal or unauthorized use of an older adult’s funds or resources for the benefit of someone other than the older adult. This includes fraud, theft, and acts of deception to gain control over a senior’s money or property. Each year, an estimated five million, or one in ten, older Americans are victims of elder abuse, neglect or exploitation. Financial abuse costs older Americans more than $2.6 billion dollars annually. Common signs of elder financial abuse include unpaid bills, eviction notices, or notices to discontinue utilities; withdrawals from bank accounts or transfers between accounts that the older person cannot explain; new “best friends;” and a caregiver who expresses excessive interest in the amount of money being spent on the older person. Share this important information with your clients today.